The moon and Venus frame the open cluster Messier 35 in Gemini on Sunday night, May 16. Full Story. On these fine springevenings, Venus shines like a brilliant beacon in the western sky for a fewhours after sunset and will soon be joined by a star cluster and a the moon ina weekend sky show. But skywatchers will need binoculars to catch the fulleffect. This coming Sundayevening, May 16, Venuswill be joined by a slender crescent moon, and the two will frame the beautifulstar cluster Messier 35, weather permitting The three will just fit in thefield of view of a pair of 7x50 binoculars. 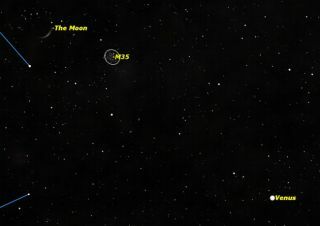 With the unaided eye, youwon?t be able to see the star cluster, but the moon and Venus will be a finesight. This skymap shows where to look to see Venus, the moon and starcluster. The bright crescent of thenew moon is lit almost from behind by full sunlight, while the rest of the moonseems to glow in ?Earthlight" — sunlight reflected off the Earth. If youlook carefully, you can see the ghostly outlines of the lunar maria or ?seas?and the bright spots which mark craterslike Tycho and Aristarchus. Just to the right of thecrescent moon on Sunday evening is the open star cluster Messier 35 in theconstellation Gemini, one of the largest and brightest star clusters in thesky. This star cluster is about3,000 light-years away from us, about as far as the farthest stars we can seewith our naked eye. It is also almost exactly opposite the center of the MilkyWay Galaxy in our sky. Venus is gradually gettingnearer to the Earth. This week it will be 1.4astronomical units distant, an astronomical unit being the average distancebetween the Earth and the sun (about 93 million miles, or 150 million km). In atelescope, it looks like a tiny gibbous moon. By Aug. 20, Venus will beat its greatest elongation from the sun, and 0.7 astronomical units away, andlook like a quarter moon. From there it quickly moves between the Earth and thesun, passing just below the sun on Oct. 29, only 0.3 astronomical units away,and moving into the morning sky. Even more startling is itschange in size, from 12 arc seconds in diameter this week to a full arc minuteon Oct. 29, five times larger in diameter. There are 60 arc minutes in 1 degreeof the night sky. For comparison, the fullmoon in the sky is about 30 arc minutes, or 1/2 a degree, wide. The tip of yourpinkie finger held at arm's length could cover about 1 degree. The next time Venus passesbetween us and the sun will be on June 5, 2012, when it will actually passdirectly in front of the sun as seen from Earth, in what is called a transit. The last time Venustransited the sun was in 2004, and won?t do it again until 2117, so thiswill be the last chance to see a transit of Venus in your lifetime. This article was provided to SPACE.comby Starry Night Education,the leader in space science curriculum solutions.